The Sala dell’Albergo was very important in the life of the Scuola because it was the place where its governing body met. For this reason it was the first to be completed, although it did not immediately have any permanent decorations. It was not until 1544 that the large table was put in place to conceal the entrance to the so-called Scrigni, a kind of bank vault used for the safe keeping of candles, documents, money and precious relics. This is closed to the public. In 1553 Titian had offered to paint the large canvas for the wall above the table, but it had come to nothing. 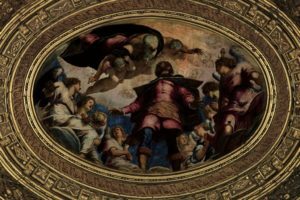 It was not until many years later, on 22nd May 1564, that the Banca and Zonta (the Scuola’s supervisory boards) decided to have the ceiling decorated at their own expense, beginning with the central oval panel. 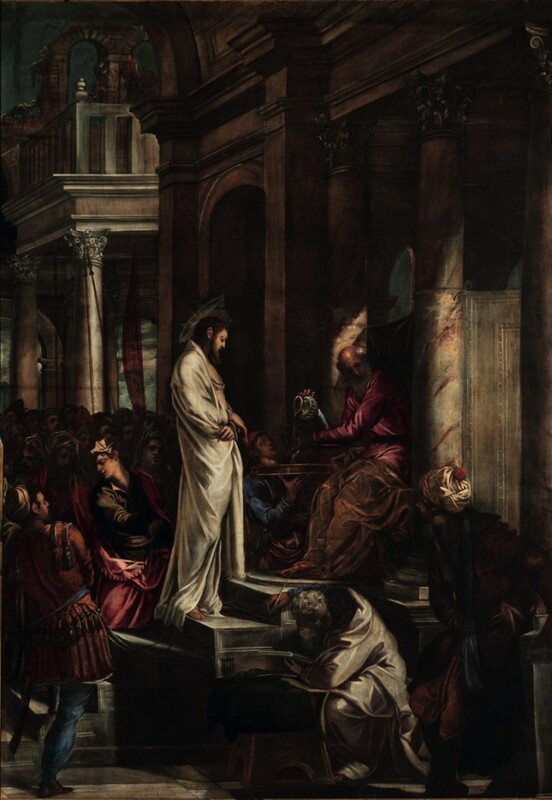 Tintoretto, who at the time had already done some paintings for the church of San Rocco, was probably chosen for the commission right from the start, but there was initially a lack of agreement on his appointment. 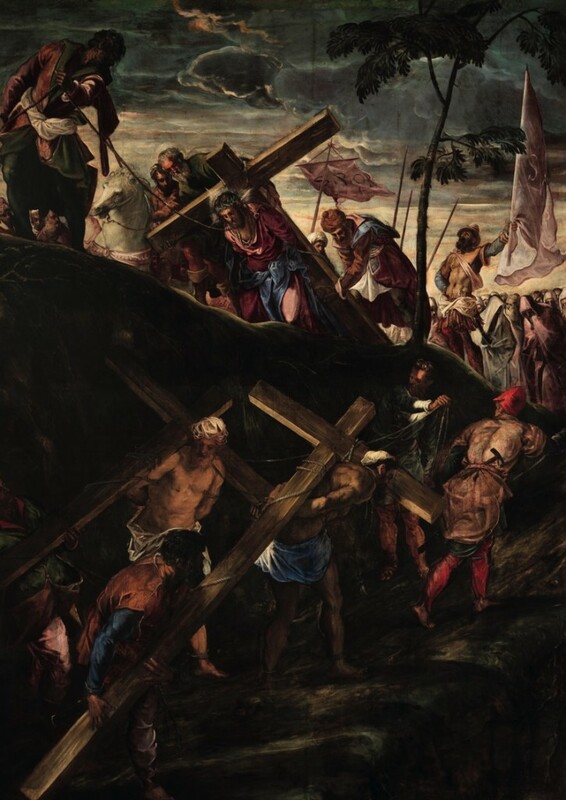 Thus it was decided on 31st May to announce a competition among the best painters in Venice, Giuseppe Salviati, Federico Zuccari, Paolo Veronese and of course, Tintoretto, who had to present their drawings to the Scuola within a month. According to Vasari’s account however, while the others were still working on their projects, Tintoretto took everyone by surprise. He actually managed to install his painting of St. Roch in glory in the centre of the ceiling, provoking the indignant reaction of the clients, who claimed they had only asked for drawings and had not commissioned the work itself. But the painter replied that this was his way of drawing, that he knew no other way, that drawings and models should be done this way so as not to swindle anyone, and finally that if they did not want to pay him for the work, he would donate it to them. On 22nd June the Scuola accepted the gift, and a few days later they ordered that the painting should not be removed. With this decision, which was undoubtedly meant to placate any resentment against Jacopo for his somewhat questionable behaviour, an extraordinary “art compact” was established between Tintoretto and the School, an arrangement which was destined to last until his death and to produce one of the most extraordinary and coherent painting cycles in the whole of Venetian art. 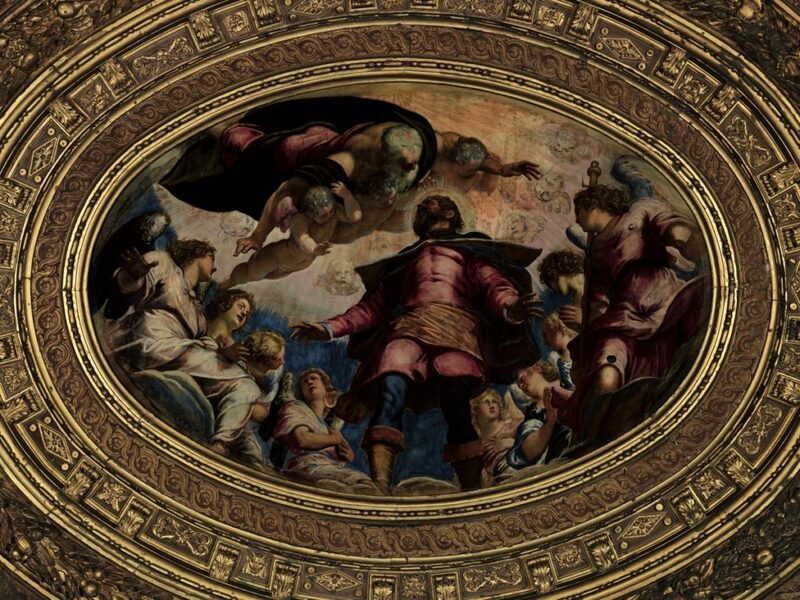 Between the summer and the autumn of 1564 Tintoretto completed the remainder of the ceiling decoration free of charge. When he finished the decoration of the ceiling, Tintoretto, who had in the meantime become a member of the Scuola, had no difficulty in also obtaining the commission for the wall paintings. By 1565, he had already finished the Crucifixion, and he then completed the cycle between 1566 and the first months of 1567. It is interesting to note how the paintings of the Sala dell’Albergo do not follow the typical subjects of the Venetian Scuole, which tended to illustrate miracles and episodes from the life of the patron saint; instead they represent scenes from the Passion of Christ. This was probably because the life of St. Roch was already the subject of the paintings in the confraternity’s church. The painter and the Scuola could thus choose a new theme; this was the beginning of a complex iconographical scheme which would be further developed in the Sala Capitolare (in English, “Chapter Room”). On the entrance wall, the story of the Passion does not unfold according to the usual narrative order from left to right. The episodes leading up to the monumental Crucifixion follow one another in an opposite direction: on the extreme right we see Christ before Pilate; in the centre, above the doorway, the Ecce Homo; on the left the Road to Calvary. The arrangement is determined by the particular meaning intended for it; the sequence is presented as the vision of the two Prophets who appear in the painted niches between the windows; in any case, the paintings are intended as objects of meditation, following a scheme which is highly charged with complex religious and spiritual meanings. Tintoretto also painted the continuous frieze, with cherubs, garlands of flowers and fruit and the coats-of-arms of the Scuole Grandi, between the ceiling and the walls of the room. 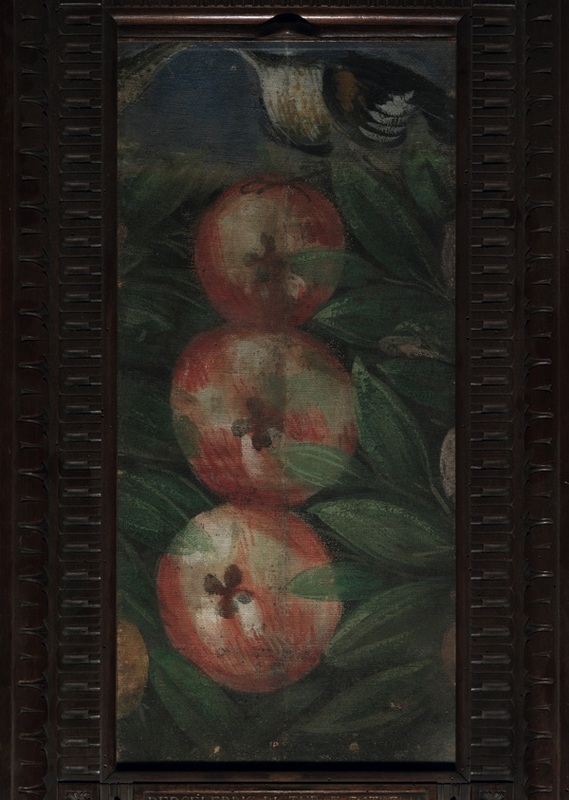 A fragment of this frieze showing Three apples, which was discovered in 1905 during restoration, and is now framed on the table, gives us a good idea of the original dazzling colours not only of the frieze but of all the painted decorations. The brightness of the original colours has in fact also been confirmed by recent scientific analysis, which has revealed how all the figures of the ceiling originally stood out against a very bright blue sky, which acted as a unifying element and made the whole decorative scheme extraordinarily luminous.